HAPPY HORSE focuses on the most important phase in any horse’s training – the first phase, when the foundation is being laid. It explains the best techniques I have discovered over my lifetime, plus what I have learned from the best in the world through observation, private consultation, books, videos and research. Every word in this e-book has hundreds of hours and thousands of dollars behind it. It is my desire to save you that time and money – because it sure takes time and money, and give something to the industry I am so passionate about. It starts with the first day in the bull pen – joining up and bonding with the horse. The various techniques of lunging are being described as best I know how – the crucial groundwork. 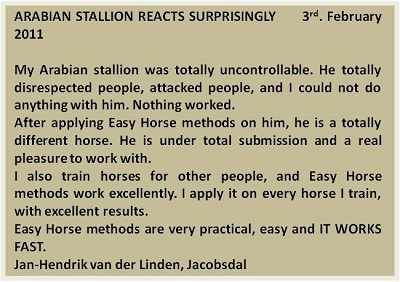 This is where the first steps of flexibility, disengaging the forehand and the hindquarters, backing, stops, flexion and total suppleness are being taught. 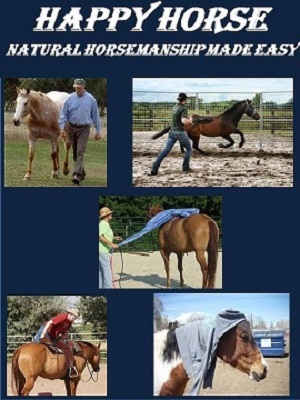 Various techniques of desensitizing are also being explained – getting the horse comfortable with noise, plastic bags, and especially allowing a human close enough to touch all over its body. Once the horse allows you into its space, you have made tremendous progress. Getting the horse tacked up and mounted are being described as thoroughly as I know how, up to the first ride. Special attention is given to one of the most important aspects of horse training – flexion and suppleness. The theme of this book is predominantly based on two principles – confidence (trust) and respect. A special chapter is devoted to vices and their remedies, such as spooking, pushing for home etc.. I intend to add to this continually. Learning is a never ending journey. I have spent a lifetime of total commitment to gain the knowledge I share with you – how many times haven’t I been ignored and given a cold shoulder when I begged knowledgeable horsemen to share and to show. What I share is what I know, and after a lifetime I admit: I have so much to learn. However, there are people out there who are just getting started. It is my sincere desire that I might have been of some assistance to you. May this book be a blessing to you.